Mater Dei High School’s new, redesigned website is Edlio's site of the week! Mater Dei’s new site showcases the school’s unique brand, beautiful photography, and impressive statistics right at first glance. 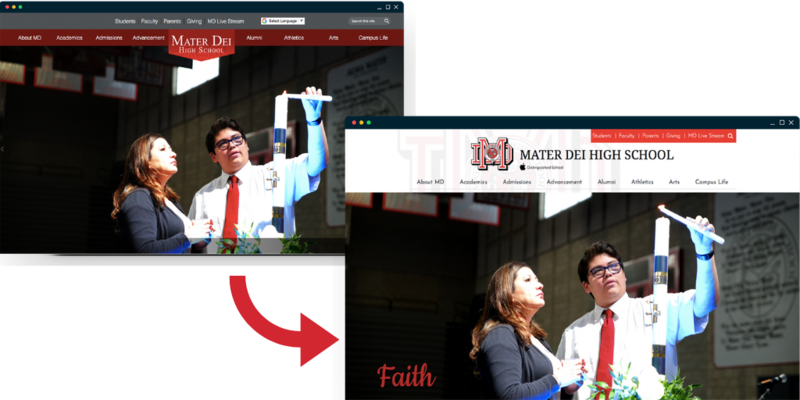 Our team loves how Mater Dei has chosen to incorporate their logo all throughout the homepage as part of the background and the header on top. We also really appreciate the shift from a dark gray and red background to white, as it helps all visitors read the content better. The school has also chosen to give their “Mater Dei At a Glance” section a new look that includes more statistics and new icons that help visitors more clearly navigate the site. One thing that has not changed is Mater Dei’s beautiful photography that helps give the site a more professional feel. Whether it’s the external pages for the Athletic and Performing Arts departments or their up-to-date calendar, Mater Dei’s redesigned site is one to get excited about.